The Watts Towers exemplify how the vision of an artist can transform the built environment while creating a world of its own. 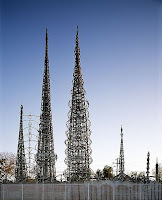 The art environment was created by the Italian Sabato (Simon / “Sam”) Rodia at his home in the Watts neighborhood of Los Angeles and includes the iconic two towers, a gazebo, walkways, and fountains. The structures were built using steel and mortar and decorated with discarded glass bottles, pottery shards, and other found material Rodia collected. The entire site was built by Rodia himself (which, incidentally, he liked to call “Nuestro Pueblo”) without the aid or help of others. Guggenheim curator James Johnson Sweeney once called Rodia a “born construction genius.” Rodia worked on the environment for 33 years, making it a truly visionary creation and a surreal architectural image in the ever changing urban landscape of Los Angeles. Because of his endeavors and the environment’s grandeur, Rodia became a well known figure but would abandon his creation in 1954 to live the rest of his life in Martinez, California. The environment was nonetheless loved by many and through the perseverance of admirers, the entire site is still preserved in its original location. 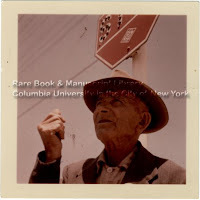 One such admirer was Kate Steinitz who took a photograph of Rodia and sent it to Meyer Schapiro. Steinitz was also an artist in her own right, she began her artistic endeavors in Hanover, Germany working with the likes of Dadaist Kurt Schwitters. Steinitz is more famously known as the world renowned Leonardo Da Vinci scholar who worked at the Elmer Belt Library of Vinciana located at UCLA. Given her background in the Dada and Surrealist art movements, Steinitz may have felt an affinity with Rodia’s art environment. She was, in fact, the archivist of the Watts Towers Committee. She would write two articles specifically on Rodia in the then new magazine Artforum— “Fantastic Architecture” in 1962 and “A Visit With Sam Rodia” in 1963. 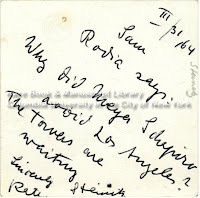 In the latter, Steinitz recounts her 1961 visit with Rodia in Martinez, California. Judging from the portrait published in that article, this photograph comes from that very same visit. Steinitz was also friends with another Rodia admirer and photographer, Seymour Rosen, who actively documented the environment and championed for its preservation. Steinitz corresponded with Schapiro quite regularly and also had mutual acquaintances such as Alfred Barr, the Museum of Modern Art’s Founding Director. In fact, Steinitz worked with Alfred’s wife Margaret to aid Schwitters in receiving an emergency visa to flee Europe during World War Two. The incisive essay “Kurt Schwitters and the Museum of Modern Art in New York” by Adrian Sudhalter gives a nice overview of this history. It remains to be seen if Schapiro did visit the Towers, although, as of yet, I can’t find evidence of that. However, Schapiro wrote on “naive painting,” a term that has origins in what is now known as “self-taught art” (of which Rodia is identified with). I’ll save those musings for another entry. In the meantime, the Watts towers are still waiting and can be viewed in person. For those of you who can’t make it, this documentary created in the 1950s shows the neighborhood as it was back then and includes Rodia working on his creation. Conservation advocates have been at odds with the financial and conservation support the the City of Los Angeles is giving to the site. This came to a head in April 2009, at a conference in Genoa, Italy titled “Art and Immigration: Sabato (Simon) Rodia and the Watts Towers of Los Angeles.” Reports from Virginia Kazor, historic site curator for L.A.’s Department of Cultural Affairs and the Committee for Simon Rodia’s Towers in Watts represented conflicting reports. Kazor’s report “Triage: the Challenge of Conserving the Watts Towers” underlined the financial shortage while the Committee’s report “Damage in Process” highlighted the lack of ethical conservation methods employed in the environment’s upkeep. 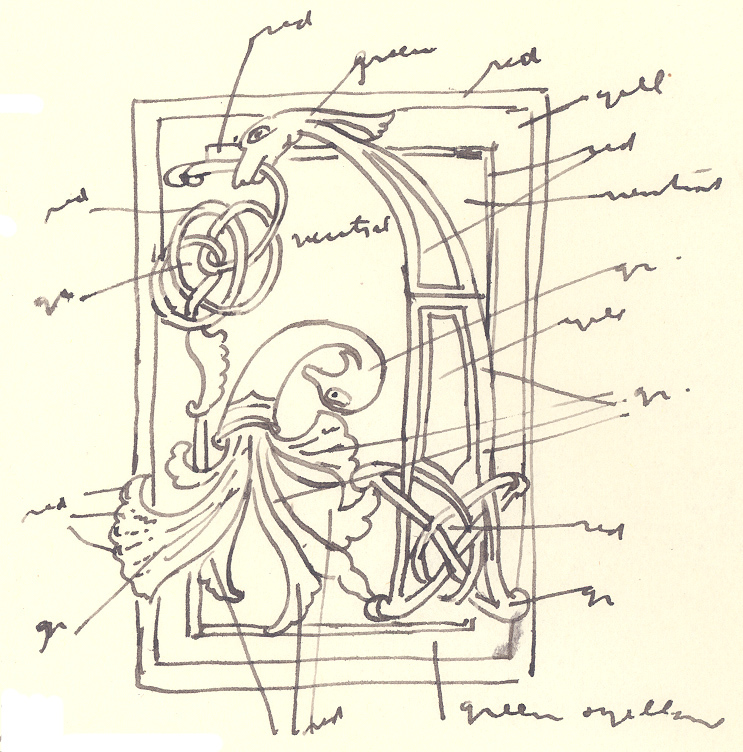 This entry was posted in Alfred Barr, Kate Steinitz, Kurt Schwitters, Seymour Rosen, Simon Rodia, Vernacular environments, Watts Towers on July 13, 2009 by Administrator.